Through some not-so-subtly-dropped hints I got a few superb presents for my birthday. One of these was a copy of the WAB supplement Hannibal and the Punic Wars which she managed to find cheaply on Ebay, and, well, what’s the first word that comes to mind when you think of Hannibal? These are the new plastic elephants from Victrix ltd. A great product – besides obviously being plastic and thus a treat to assemble, it comes with plenty of options for Ptolemaic, Roman, Numidian and, of course, Carthaginian versions. For me, that’s great – I used the linothorax-armoured riders with Carthaginian heads, but I can also use the Roman bodies in chainmail as veterans or Latin deserters, and the Numidians as allied infantry. Great! I used the Little Big Men Studios decals as they are simply lovely – I can freehand, but not to anywhere near the level I’d need for this kind of patterning! A word on this to those readers who are interested in doing the same: It’s much, much easier to apply the decals before you affix the tower to the elephants. I had to cut down the decals on the ‘saddle cloth’ and had a lot of trouble getting the smaller ones to stick where they had to. Other than that, painting was straighforward. The crew were painted identically to my other Carthaginians (more news on those soon, I hope), but the elephants were, naturally, rather a different matter. I drybrushed a dark grey and then a middle grey over a black undercoat. This looked crap, so I went in with the middle grey again but applied it as a layer highlighted, in angled streaks so as to get the right skin texture. The edge of the ears received a small layered highlight of medium skin tone applied directly over the grey, before everything was washed agrax earthshade. Overall I had a great time painting them, even though it took nearly a month of on-and-off work! Right before they were done I already played a WAB battle with them, and they were quite effective. WAB is the reason why I decided to base them on 50x50mm bases; for those games which specify a unit breadth of 12cm I’ll prepare a bare 20x50mm base to put in between the two models. There! Hope you like these as much as I do. I’ll have more Carthaginians ready in a bit, so there might be more Ancients on the blog very soon. Ceterum censeo Duvel esse bibendam! It’s the end of 2017, and another project has come to a close – huzzah! 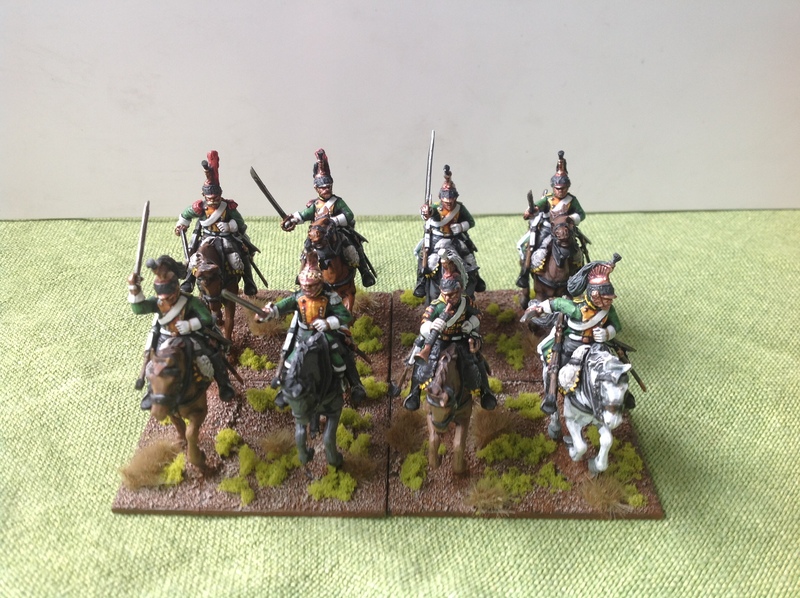 These hospitallers were actually among the first of my historical projects, being started up all the way back in – I think – 2012 with a box of plastic knights from Fireforge. I grew disenchanted with the models after having painted up just half the box’ contents, and the cavalry wing of the army has been neglected far too long, until this year. The rest of the cavalry will have to bide its time until it can appear on the blog, though, as the matter at hand is rather more interesting! First up, we have the supreme commanders of the army – the grandmaster and a priestly fellow! Notice how I have tried to make them stand out a bit by using the idiosyncrasies of the figures – which are actually from Gripping Beast’s Teutonic range – such as the hair, the mitre, and so on. Colourwise I have added yellow to the palette, as white and yellow are papal colours. Stoving in Saracen skulls, approved by every pope since 1098! Next up, these are two battle standard bearing types, predominantly to be used in WAB. As you can see I have used some leftover plastic bits from Fireforge kits to add some flair to these Gripping Beast models. Finally, here are four other seneschal models. Most of these are from the Gripping Beast crusader command set, with one other stray Teuton (the one with the fur, of course!) added in. These have also all been modified to carry leftover weapons from Fireforge kits, as there is certainly a scale and style difference between the two manufacturers. As well as painting dragging on for years on this project, rolling dice in anger with them is long overdue! So, to that end, my friend Flor is coming over with his Teutonic Order soon and we’ll duke it out using the WAB rules to see whether black with white accessories or white with black accessories is best. Groovy, baby! 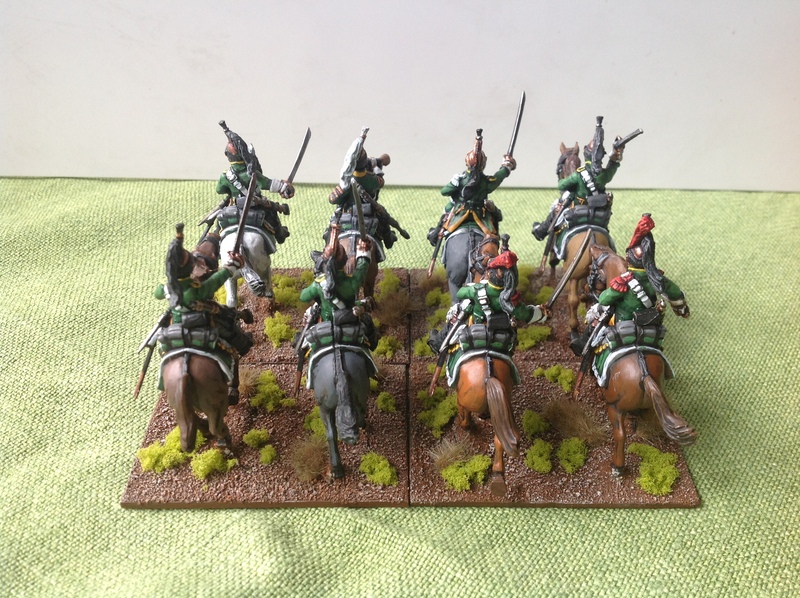 It’s Yesteryear Wednesday again, and here are those French dragoons I promised you last week, when I showed you the dismounted guys. I’ve been doing some painting today, had a mediocre run on the Finnish track, and now I’m settling down with a couple of White Chimay beers and a good Bernard Cornwell novel for the night. But first, these dragoons! Another finished unit of Perry Miniatures plastics. Half of this unit was painted right after I came back from France in September last year, but I was so fed up with warpstone green’s coverage issues that I let the rear rank of the unit lie unpainted until the beginning of this year. That’s how bad it was! The impulse to paint them finally came this year when I played a game of WAB – Waterloo with a few veteran players; I had to borrow part of their collection, which I never like to do. There’s just something harrowing about considering the plethora of mishaps that can befall even a veteran wargamer when handling another player’s models! A white horse for a ranker! Not an error I’ll repeat on future units. I must confess I cheated a bit: this unit did receive some brush attention earlier this week. This is because I noticed that the spray varnish I used, the GW purity seal, had left some small white stains and a slightly foggy effect on some of the areas of the models. I don’t know exactly what caused this, and other models that were sprayed with the same spray can, but I felt it had to be corrected. Apart from this, the bases also received additional tufting as I had described last week. Some further beginner mistakes: one of the epaulettes of the elite company is missing, and the elite company rode black horses. So that’s it for these guys. 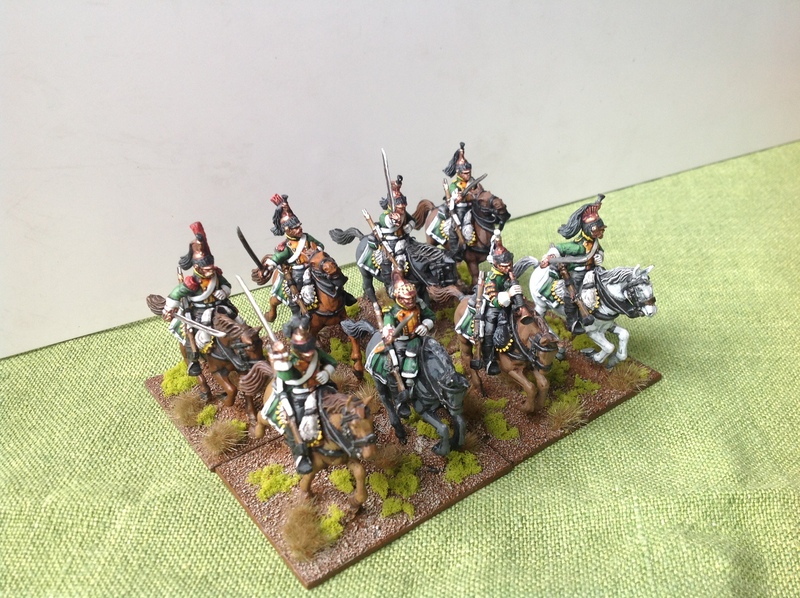 There might be further Wednesdays in the near future where I demonstrate and discuss the existing units of my French Napoleonics as I go about tufting their bases – I still have two battalions of line and a squadron of 9th Hussars which I can show you. But in the interest of variety I will try and vary my offerings, much as I try to vary my week-to-week painting projects. So who knows what next week will bring! As for progress on those Chevau-Légér Lanciers: slow. I’ve been having a busy week at work and some equally busy evenings, as well as a rather alcoholic weekend coming up, so I might not get the riders done in time. The good news is that I’m doing all eight of them in one go, which does mean I’ll be able to immediately show you a complete unit. Vive l’Empereur, Vive la France!